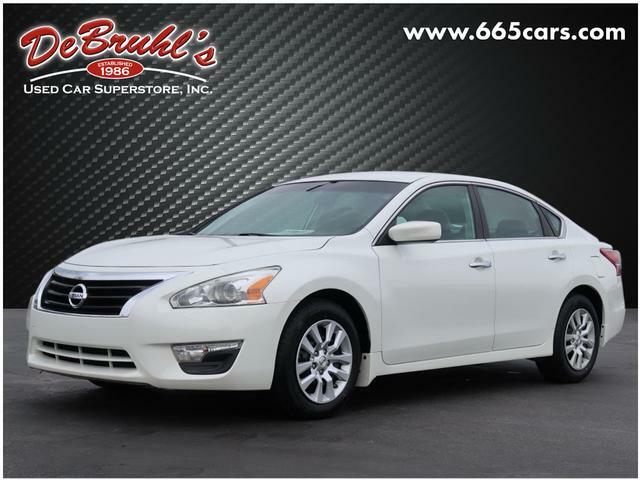 * TELESCOPING STEERING WHEEL * * GREAT DEAL AT $11,950 * * A RATING FROM EDMUNDS * * 2013 ** Nissan * * Altima * * 2.5 S * When youre ready to upgrade your ride, opt for this 2013 Nissan Altima 2.5 S, which includes features such as push button start, a leather interior, heated seats, traction control, AM/FM radio and CD player, anti-lock brakes, dual airbags, and side air bag system. With a dazzling white exterior and a charcoal interior, this vehicle is a top pick. This one scored a crash test rating of 5 out of 5 stars. This 4 dr sedan has a sporty look with the rear spoiler feature. Good cars sell fast! Give us a call and schedule an appointment today! DeBruhls Used Car Superstore is the largest independent auto dealer in WNC! We offer a full range of financing with our guarantee credit approval, everyone is approved here.